24-Feb-2007 -- As each of the 6 points around Ankara that we have yet to capture can be visited in a day trip, we decided to complete these ones at a time over the next few months. As the weather forecast for the north of Ankara was not favourable, we decided to head southwest for 39N 32E. We took the Eskişehir road out of Ankara and headed for Polatlı where we turned off in the direction of Akşehir. After about 40 km we turned towards Uzunbeyli via Özyurt and Adatoprakpınar. At Uzunbeyli we planned to take the road towards İshakuşağı until 39N where we would attempt to find a track eastwards, as this seemed to be a shorter distance than attacking the point from Yüzükbaşı. After eventually finding the correct way out of Uzunbeyli, a local resident advised us that the road was impassable in two-wheel drive cars (unfortunately our 4-wheel drive is on repair). As such we back-tracked and headed for Yüzükbaşı, which is where the first visitors went in the first place. 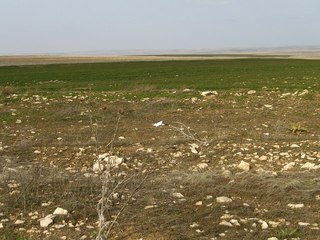 In Yüzükbaşı we found a track out of the village and headed for the point past a group of abandoned houses. We managed to drive until we reached 31°59.840'N 32°00.981'E where the track became too bad to continue and hence we set out on foot for what turned out to be an easy 2.1 km walk over agricultural land, although the absence of any trees gave the place a barren look. #7: Oh - the elation! !